To prevent extinction of the Critically Endangered Hooded Grebe and secure its future. Discovered by accident in 1974 by the famed Argentine ornithologist Maurice Rumboll, the hooded grebe nests on lakes and lagoons of Patagonia’s windswept plateaus. Declared Critically Endangered in 2011, the global population hovers around 700 individuals. Its population decline in recent decades is attributed to the introduction of mink and trout in its breeding range and increased predation by kelp gulls, a native species whose population has increased for anthropogenic reasons. The good news is that the chief causes of its decline have been identified and are being addressed by this project, averting what would undoubtedly be a path to extinction. As mentioned above, predation by introduced mink; competition and adverse ecological changes from introduced trout; predation by kelp gulls; windblown sedimentation of lakes resulting from sheep grazing; drowning in fishing nets at wintering grounds; and increasingly extreme weather events, which flood nests. The project has ended this species' rapid population decline through mink control and other conservation actions. We are deterring Kelp Gulls (which prey on Hooded Grebes) from breeding near hooded grebe colonies. Educational activities at the Interpretive Centre in Río Gallegos have brought widespread public awareness of and interest in the hooded grebe's plight. Efforts by project personnel led to a regulation forbidding the introduction of trout on the Buenos Aires plateau; the aim is to extend this regulation to other plateaus. Our local partner has been successful in reducing drowning in fishing nets at coastal wintering areas by encouraging fishermen to shift fishing activities away from areas used by the grebes. In the 2017 breeding season, 764 adults and 100 juveniles were recorded at 15 colonies on the Buenos Aires and Strobel plateaus. Results since 2009 indicate that the population has stabilized. Did the hooded grebe inspire the Argentinian tango? Our partner is the Argentinian conservation organization Asociación Ambiente Sur, with project leader Santiago Imberti. Ambiente Sur works together on hooded grebe conservation and research with Aves Argentinas (project leader Hernán Casañas). The Hooded Grebe, Podiceps gallardoi, is endemic to Santa Cruz province in southern Argentina. Its breeding range is restricted to upland plateaus (above 700 m asl) in which basaltic lagoons, where the grebes breed, are interspersed with grasslands and sheltered areas with shrubs. During the austral winter (the non-breeding season) the grebe migrates to the Atlantic coast where it winters in river estuaries — areas that are also important for wintering shorebirds, both Patagonian and Neartic. Now listed as Critically Endangered, the species has declined from a population estimated at 3000-5000 in the mid-1980s to one "unlikely to exceed 800". The good news is that the chief causes of its decline have been identified and can be addressed. Ambiente Sur (our partner) and Aves Argentinas have developed a comprehensive program that counters the key threats. They have already been successful in reducing drowning in fishing nets at coastal wintering areas by encouraging fishermen to shift fishing activities away from areas used by the grebes. Following years of promotion by Argentinean conservation organizations (Ambiente Sur, Aves Argentinas and Fundación Flora y Fauna Argentina), a new national park — Parque Nacional Patagonia — was created in March 2013. This will protect a sizeable portion of the breeding range of the Hooded Grebe, and the aim is to futher expand the park to include more if its breeding range. Surveys are conducted annually to estimate breeding population and locate colonies. In the 2014-2015 breeding season, the 771 adult grebes tallied represent an increase from preceding years. Breeding at 12 colonies produced 138 surviving juveniles from 357 nests. A guardian is stationed at each active breeding colony; volunteers are trained and engaged as field assistants. Control of American mink (mainly trapping) is a crucial activity; guardians and volunteers also collect information on mink numbers and distribution. Mink control has greatly improved grebe breeding success and mink numbers at grebe breeding areas are now lower. The long-term plan is eradication of mink from high plateau breeding grounds and a reduction in their number in the surrounding low plateaus. Measures are taken to deter breeding of Kelp Gulls near Hooded Grebe colonies and this has also reduced mortality and numbers of Kelp Gulls at grebe colonies. Funded separately: Removal of trout from lakes (using a team of artisanal fisherman) and preventing introduction of trout to new areas. Surveys and monitoring at wintering sites (Atlantic coastal estuaries) takes place each year. Public outreach and education efforts in Río Gallegos have been pivotal in developing local awareness of the Hooded Grebe and its plight. The local interpretive centre at Rio Gallegos is increasingly populular. A 3-dimensional dynamic display there depicts the grebe habitat and threats. Volunteer training and the employment of young local conservationists is increasing conservation skills in this remote and harsh environment. 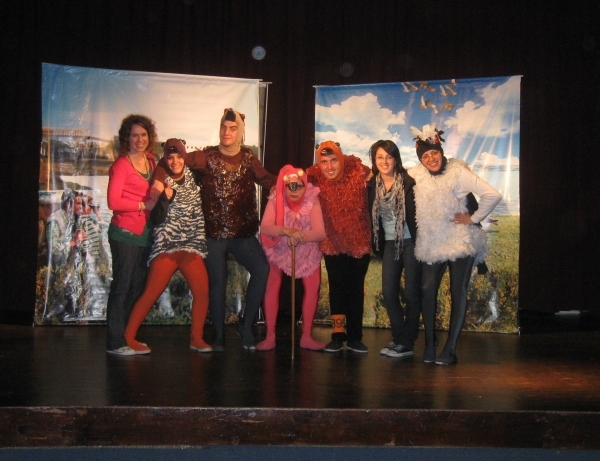 A theatre play about the Hooded Grebe titled "Quien se ha robado mi nido? Macanudo problemo!" ("Who has stolen my nest? What a problem!") reached 2590 people in 28 performances. Written especially for kids, the humour and messages were also much enjoyed by adults. The Hooded Grebe's story is also being effectively communicated through a new documentary film, brochures, lectures, photo exhibitis and presentations. Information and technical know-how gained through the projects is being shared with government agencies (including managers of Argentina's new Patagonia National Park) and the scientific community. In March 2013 Argentina declared a new national park — Parque Nacional Patagonia — support for which was leveraged by this project. This represents a major breakthrough for the grebe and the region, protecting 52,000 hectares and one of the most important grebe breeding colonies. The research informing this project invovles various collaborators: researchers from Centro Austral de Investigaciones Científicas worked on the American mink component; Centro Nacional Patagónico, Universidad Nacional de Buenos Aires did limnological (freshwater) work; and the Administración de Parques Nacionales assisted in limnological work and is developing the newly created Patagonia National Park. Increased attention is being given to the plight of the Hooded Grebe and efforts to save it. Over 100,000 people have watched a 45-minute documentary on the Hooded Grebe. The new national park is a huge step forward in conserving the Hooded Grebe. And the two Argentinean conservation organizations who, with Fundación Flora y Fauna Argentina, made that park a reality will continue to do their utmost to secure the future of this enchanting bird. ICFC looks forward to continuing to partner with Asociación Ambiente Sur in this effort.